Take Your Office to 30,000 Feet! At Republic, you’re part of an Associate-driven company that values teamwork, mission, accountability and achievement. Your “office” is the cabin of the ultra-modern Embraer 170/175 aircraft where you’ll be part of the team supporting our codeshare partners—American, Delta and United Airlines. If you’re ready for a career that literally puts you at the top of the world, apply today! Successful completion of FAA-certified 20+ day training program at a company designated location. 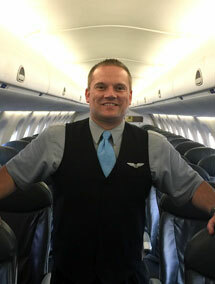 Maintains Flight Attendant qualifications by successfully completing all Company required training. Possess and maintain a valid US passport or foreign passport. Authorized by law to work in the United States and able to travel in and out of the United States. Must not have tattoos visible while in uniform. Tattoos are not allowed on the head, neck, decolletage, lower arm: on or below the bend of the arm to include hands and fingers. Our codeshares do not allow make-up, jewelry, bandages or watches to cover any tattoos. Find our recruitment team at an event near you! Want to connect with one of our recruiters? Email us at PilotRecruitment@rjet.com. "I have the privilege of working with a very diverse and experienced team onboard flights to cities located throughout the United States, Canada, the Caribbean and Central America. Republic has also given me the opportunity to get involved in the overall organization, serving as a member of the Base Partner Program Action Team and the 2016 Inflight Recurrent Training Focus Group. Moreover, the flight attendant position also offers a great deal of flexibility, which has allowed me to continue working as an Attorney when I am not flying."